Product identifiers like brand name, MPN, and different GTINs make it even easier for shoppers to find and buy your items. Jim “Griff” Griffith explains how simple it is to add product identifiers to all of your new listings to help buyers find your items in eBay search and in search engines. eBay uses an item’s brand, manufacturer part number (MPN), and global trade item numbers (GTINs)—such as Universal Product Codes (UPCs) and International Standard Book Numbers (ISBNs)—to help buyers quickly find the items they’re looking for. For sellers, including these product identifiers not only increases your items’ visibility in eBay search results and navigation, it improves your placement in search engines like Google and Bing, too. To take full advantage of these benefits now, include product identifiers every time you list. Increasing the accuracy of listing information through product identifiers and item specifics is an important part of our ongoing work to improve the marketplace experience for all users. That’s why new listings of branded items in new condition are required to include them. Starting June 29, enforcement of product identifiers will begin in select categories. Beginning in 2016, product identifiers will be required for multi–SKU items and in a number of additional categories. eBay will notify sellers 90 days in advance of enforcing the requirement, to give you time to update your listings appropriately. Continue to check this page for updates—and add product identifiers whenever you can, even if they’re not yet required. Trending price alert in view item when your listings are priced lower than the trending price and include product identifiers. Use the eBay bulk edit and relist tool, Turbo Lister, or contact your 3rd party tool vendor to add product identifiers to qualifying items within your existing listing inventory. Learn how. Note: Sellers who list used, collectible, vintage, or one–of–a–kind items are not required to include these unique product identifiers at this time. Be sure to include your item’s unique product identifiers any time you list branded items in new condition—particularly in the categories listed here. Use eBay’s bulk listing and editing tool to update your existing listings with the required product identifiers now to take advantage of increased search visibility. To save time—and to make sure your listing is as accurate as possible—match your item with a product from the eBay catalog every time you list. When you do, the unique product identifiers for your item are included automatically in your listing. 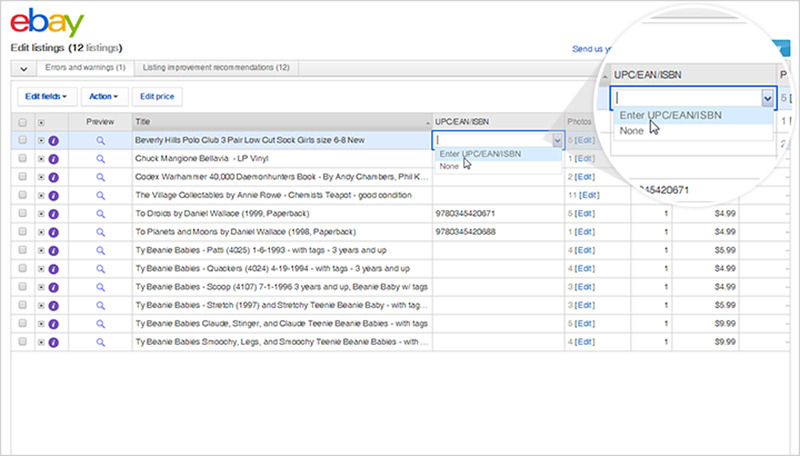 Review eBay’s best practices for maximizing your position in Best Match search results. And remember, creating great collections can also help attract more buyers to your listings. Most new, branded items have unique identifiers that help buyers recognize and find them, including the item’s brand, manufacturer part number (MPN), and global trade item number (GTIN). These GTINs can include an item’s Universal Product Code (UPC), European Article Number (EAN), or International Standard Book Number (ISBN). Why is eBay now requiring product identifiers on some items? Search engines, including the one on eBay.com and external sites like Bing and Google, use thousands of algorithms to help identify and display relevant product matches during online search sessions. Product identifiers help those search engines capture eBay sellers' merchandise and display it for relevant searches. Product Identifiers also help grow the eBay catalog—which will ultimately facilitate faster, better buyer/item matching on eBay.com. Over time, as more sellers use product identifiers in their listings, the eBay catalog grows—connecting more shoppers to your listings. In which categories are product identifiers required? Starting June 29, enforcement of product identifiers will begin in select categories. Be sure to add the necessary product identifiers to your listings now and make sure you’re ready. Beginning in 2016, product identifiers will be required for multi–SKU items and in a number of additional categories. eBay will notify sellers 90 days in advance of enforcing the requirement, to give you time to update your listings appropriately. Continue to check this page for updates—and add product identifiers whenever you can, even if they’re not yet required. Do I have to provide product identifiers for refurbished items? Yes, refurbished items that are being listed in manufacturer refurbished condition will require product identifiers. Items listed in seller refurbished condition will not require identifiers. Are multi-SKU listings included in this requirement? 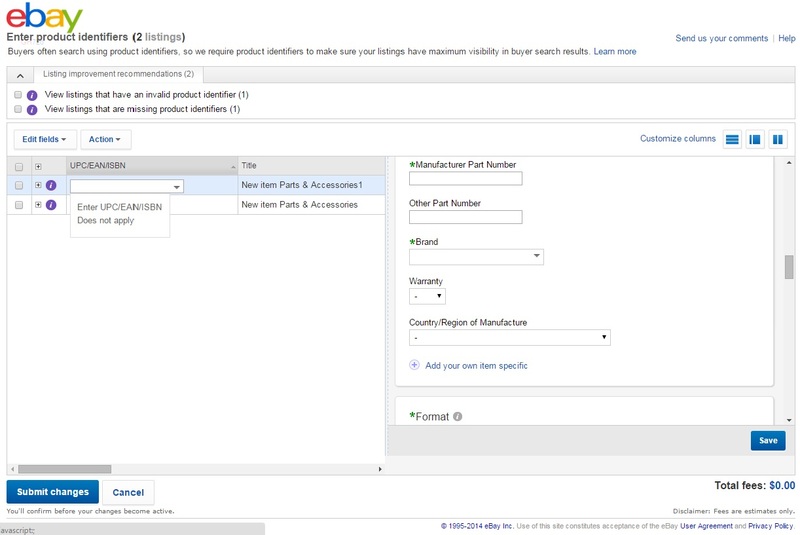 Starting in early 2016, you will be required to include product identifiers for new and manufacturer refurbished multi-SKU items with variations in the selected categories to complete listing in all ebay.com listing flows. Until then, in the majority of listing tools you will be able to voluntarily include product identifiers at the variant level, so be sure to add them to gain a competitive advantage in search results. I sell used/collectible/vintage/one-of-a-kind items—do I have to add product identifiers to my listing? No. Although we recommend that you use product identifiers whenever possible to maintain search visibility, they are not required for listings of used, collectible, vintage, unbranded, or one-of-a-kind items at this time. What are the benefits of including product identifiers in my listing? How do I find my item’s MPN or GTIN? Most manufacturers list identifiers like MPN and GTIN directly on a product’s packaging, and often right on the product itself. Remember, when you match your item with a product in the eBay catalog, the unique identifiers for your item are included automatically in your listing. How do I add the required product identifiers to my listing? Any time you create a new listing, use the appropriate fields to include your item’s required product identifiers. See the location of this field in TurboLister below. I already list my items using the required product identifiers. Do I need to do anything else to meet the requirement? No. Many sellers already include all of the required product identifiers in their listings. For these sellers, there’s no additional action to take. How do I locate and update listings in required categories? Go to My eBay or Selling Manager to see your active listings. Click on the link at the top of the page for "Add required product identifiers". You'll be redirected to the eBay Bulk Edit and Relist Tool (BEAR). Enter the UPC, ISBN or EAN. If the product does not have this information, select "Does not apply". Update the Brand and Manufacturer Product Number (MPN) fields where required. Note: If the product does not have an MPN, set it to "Does not apply". If it doesn't have a brand, set it to "Unbranded". Click "Submit changes" to publish the changes. Steps 1-2: Locate items that need to be updated with product identifiers. 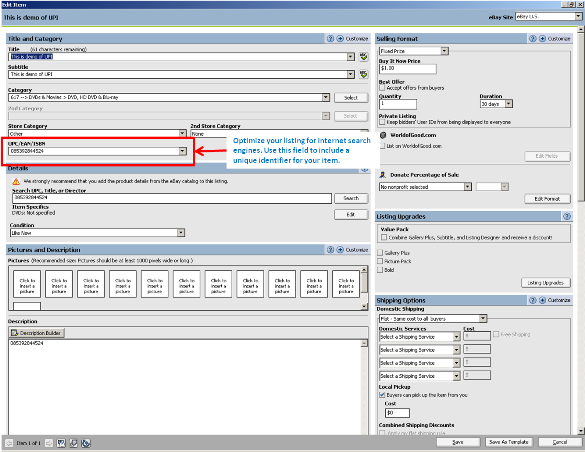 Steps 3-5: Adding product identifiers using the Bulk Edit and Relist Tool. How do I add product identifiers to items where they are not required, but I still want to use them to help boost my search results? When you're creating a new listing, simply click "add your own item specifics". Will I need to add product identifiers when I revise my Good 'Til Cancelled listings? Manual relists/revisions to existing listings that don't already contain product identifiers will require you to add brand, MPN and GTIN to complete and post the listing. Good 'Til Cancelled listings that you created before June 29th will continue to appear, even without product identifiers, unless you manually relist them or revise them, but will begin to lose visibility in search results. It's recommended that you edit your Good 'Til Cancelled listings using the bulk edit and relist tool or Turbo Lister to make sure buyers can easily find and purchase your items. I don't see the product identifier fields when I list on my mobile device. How can I add them? If you usually use a mobile platform to create your new listings, you can continue to list as usual. You’ll simply need to use one of the other ebay listing tools to enter product identifier information. Be sure to talk to your 3rd party listing tool provider about using product identifiers if you list using a non-eBay listing tool. I am reselling a new item but I can't find any product identifiers on the box or on the item. What should I put in the required fields? If you know the brand or model information but don't know the MPN, GTIN, ISDN or UPC, search the eBay catalog when you list or relist your item. Additionally, the eBay catalog saves you time by auto-populating item description with accurate, validated product information directly from the eBay item database. If your item isn't yet listed in the eBay catalog, search the manufacturer's website or perform a web search using the brand and model to help locate the correct product identifiers. If you don't know the brand, and there is not a visible product identifier on the item or its box, try searching the web or contacting your supplier. If you list new items that are considered white-label, custom manufactured, samples not for retail, or other types of new or refurbished products that do not have product identifiers, please enter "Does not apply" in the required fields. 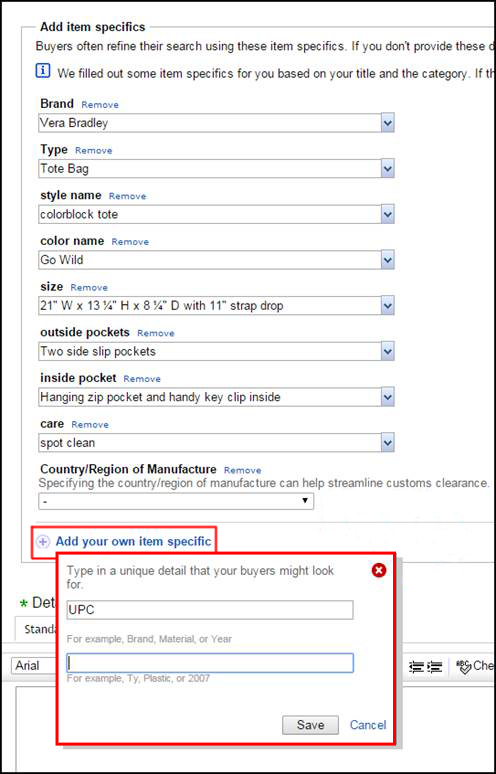 Note: If you purchase your own product identifiers unique for custom items, you may enter them in the required fields during listing. What should I do if I sell branded vintage items that are new, but there are no product identifiers? Some vintage items that are still new condition may not have product identifiers available. For example, books older than 1960 likely do not have ISBN. In these cases, the item would be considered 'vintage' and product identifiers are not required to complete your listing. Simply enter the words "Does not apply" in the product identifier fields to complete your listing. I sell new and unworn sample shoes that are not in a box. Do I still need product identifiers? If you list new, branded items that are considered white-label, custom manufactured, not intended for retail or other types of new or refurbished products that do not have product identifiers, you may enter "Does not apply" in the required fields. If I use "Does not apply" in a required product identifier field, will buyers still be able to find my item in Search? If a product identifier truly does not exist and you enter "Does not apply" in the field, your search visibility will not be affected. If the product identifier does exist and you enter "Does not apply" in the required field, your item will lose search visibility—meaning, shoppers will have a harder time finding your item on eBay and on external search engines. We strongly recommend sellers use "Does not apply" only when product identifiers truly do not exist to maintain visibility and remain competitive. I entered a UPC code but I'm getting a message that it's invalid. What's wrong? A product identifier would only get rejected if (1) it was not a valid product identifier, or (2) it was already associated to a different product. 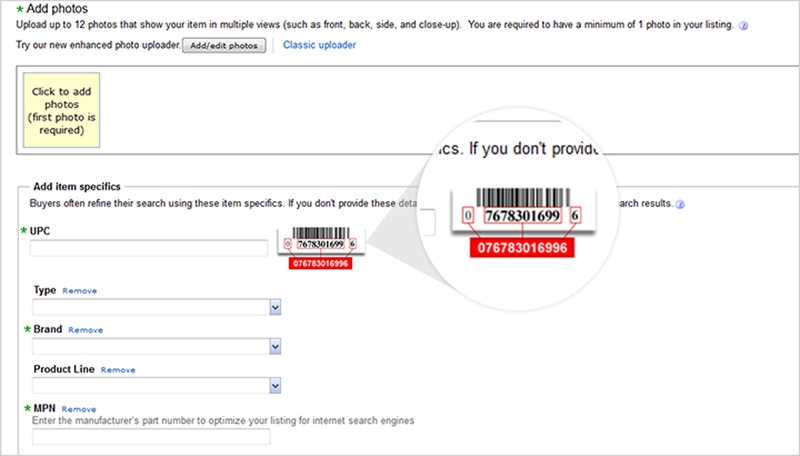 If you're having trouble with a UPC, you can validate them online (just do a web search for 'UPC validator'). If you are entering a confirmed, valid UPC and it is not conflicting with an existing product already in the eBay catalog, please contact eBay Customer Service to troubleshoot. What if I am selling a bundle or group of items that could have multiple product identifiers? Bundles are defined as multiple different products being grouped together and sold as a single offer. If the bundle is created by the manufacturer, use the identifiers provided by the manufacturer for the group. For example, a gaming system that includes controllers and other related accessories that usually have a unique UPC applicable to the entire kit. If it is a custom bundle of items without a primary item (items have similar relative value—for example, a bundle of DVD movies) use "Does not apply"
If the offer contains multiples of the same product we refer to that offer as a "lot". Use the identifiers of the item that is grouped and use the lot size value to indicate the quantity in the listing. For example, if you are listing a 12-pack of blank DVDs, you'd utilize the product identifiers from a DVD pack and inter a lot-size of "12" when creating the listing.